With a simple and enduring diamond pattern at its heart, the Echo Rug by Plantation Rugs is a stylish choice for many different spaces in the home. Cleverly patterned with a simple repeated diamond motif, each rug has a simple elegance to it. With a choice of three gentle colourways this rug can be enjoyed in many different styles of home and interior. 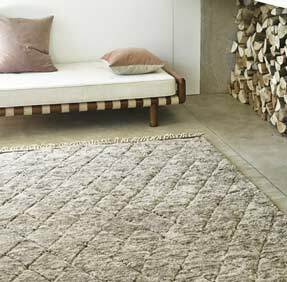 The Echo Rug is crafted from 100% pure wool and is finished with fringed edging on its shorter sides. The rug can be enjoyed in a choice of sizes and as a Plantation Rugs piece you can expect the same exceptional quality found in all of their products.